Last year I had the good fortune of building a catio for a client based on the recommendation of The Cat Counselor, Cristin Coll. Cristin, a Certified Feline Behavior Consultant, worked her magic and brought harmony to a large feline / human family that was experiencing severe behavioral issues. She is plain and simple a cat expert. Having also previously worked with Jackson Galaxy, I can confidently say that I’ve worked with two of the best in the business. With that, I was excited when Cristin agreed to this interview. Catio Guy: You have a lot of letters next to your name! Can you explain your background and what those letters stand for? Cristin: So many letters! And I’m actually working on adding more to that collection. My initial certifications are through the Animal Behavior Institute. Over a year, I took courses in Feline Behavior and Enrichment, Feline Training, Feline Nutrition, General Animal Behavior, and Advanced Feline Training. Then I completed 100 volunteer field hours dedicated to in-home and shelter behavior cases. All focused on cats! Once completed, I earned my CFTBS (Certified Feline Training & Behavior Specialist) and CAFTP (Certified Advanced Feline Training Professional). I’ve taken several additional courses through the International Association of Animal Behavior Consultants (IAABC). Once I finish a Pet Nutrition Coach Certification, I will begin working on another behavior certification through IAABC. Furthering my education and staying up on all the best ways to help cats and their families is important to me. The animal behavior and training field is fairly unregulated, so it is imperative that people do their research on behavior consultants and trainers. Catio Guy: What does a Certified Feline Behavior Consultant do? Cristin: Feline behavior consultants specialize in preventing, managing. and modifying challenging behaviors in cats (IAABC). We assess the situation, provide a functional characterization of the problem behavior and offer interventions that can help pet owners reach a satisfactory solution (AVSAB). Basically, my job is to figure out what might be causing a cat to perform the behavior(s) that the pet parent deems inappropriate and work on a behavior modification plan to improve the behavior(s). Catio Guy: Can you explain your process once you are hired? Cristin: Once I learn the type of behavior issues and the number of pets involved, I provide a service/rate quote and try to schedule a consult within 3-4 weeks. Pet parents submit an electronic pre-consultation questionnaire, along with an agreement/waiver, 72-hours prior to our appointment. This provides me with the detailed history I need to prepare for our time together. A vet visit is always recommended before we meet, as many behavior issues can have underlying medical causes. The in-home consultation usually lasts about 90-120 minutes and is pretty informal and conversational. I will dive deeper into the questionnaire, interact with the cats, and assess their behaviors and environment. We go over some initial behavior modification and enrichment recommendations and I will leave some informational handouts. A complete written plan is provided within 3-business days. I like to break my recommendations up into weekly, bite-sized pieces, to prevent overwhelming the cats or their families! Once the behavior plan is set, I depend on the pet parents to follow-up and check-in. Depending on the issue, I generally recommend weekly check-ins to determine what is working and what needs modifying. Most of the follow-up is done via email but some cases can require additional visits. Catio Guy: You meet countless cat families annually. What are the most typical issues you see? Cristin: The most common cases I see are litter box issues, cat on cat aggression, and aggression toward humans. Additionally, I see anxiety, destructive scratching, compulsive chewing, excessive vocalization and over-grooming cases. I also regularly handle first time cat-parenting consultations and “happy habitat” sessions. These are more proactive approaches that ensure cats and kittens are set up for success and help prevent future behavioral issues. Catio Guy: What are the most common and easily preventable mistakes cat parents make? Cristin: Environment and enrichment can make SUCH a huge difference in the lives of cats. You are quite familiar with this yourself! People are always surprised when I explain that appropriately playing with their cat, on a daily basis, can help improve many behavior issues. It’s true! Cats need mental stimulation and physical activity just like we do. Catio Guy: What was a particularly challenging situation you faced that you are proud of resolving? Cristin: I get to work with so many unique and challenging cases, it’s hard to narrow it down to just one. But, my time with Bert is one of my proudest and most rewarding experiences. 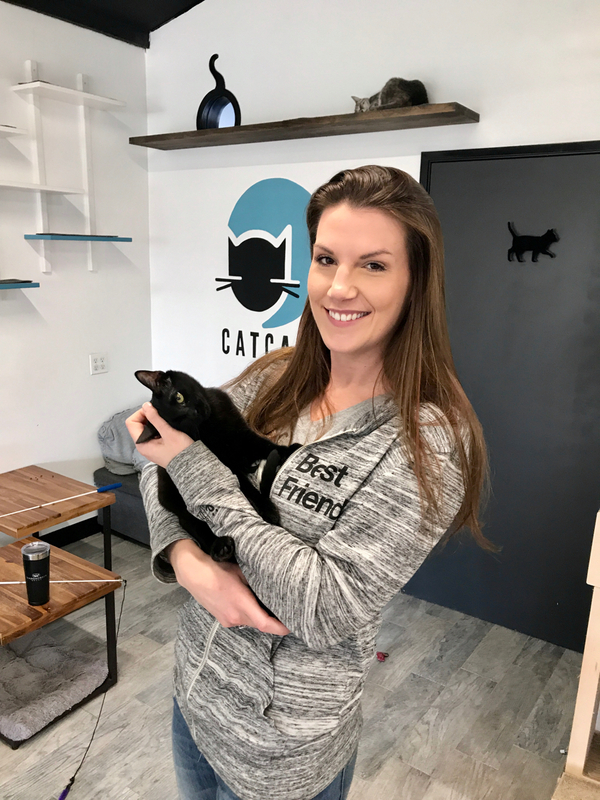 I started volunteering at the CatCafe Lounge (see our interview with CatCafe Lounge founder Kristi Labrenz Galvan) about a year ago. It’s a non-profit cafe in West LA that helps cats get adopted. Since it opened last February, over 150 cats have found their forever homes. My focus is working with shy/under-socialized cats, helping them become more trusting of humans, essentially getting them ready for adoption. Bert was one of the original cats to arrive at the cafe. A street cat who found himself in the shelter system, he was incredibly skittish, fearful, and not accepting of human touch. He liked to play and was happy with other cats but had no interest in humans. After a couple of months of weekly sessions Bert began to trust me and allowed me to pet him. It took a lot of patience and chicken baby food (secret socialization tool), but Bert blossomed into a sweet, chatty and affectionate boy. Arriving each week, I would call “Berty Bert” and he would come running to greet me and cuddle up on my lap. The first time I heard Bert purr, it brought tears of joy! Bert met another boy at the Cafe named Ozzy and they formed an incredible bond. In February, Bert and Ozzy went to their forever home, TOGETHER! They were adopted by a lovely couple and joined another kitty sister. Catio Guy: I personally saw you work your magic with a kitten named Summer. Can you describe the issues you discovered and the recommendations you made to remedy the situation. Cristin: They are such a lovely group of cats and their parents are amazing! In most cases, more cats equate to greater challenges. Different aged cats and special needs cats add to the difficulty. In this case, we were dealing with integrating two younger cats into a larger group of cats, one of which was special needs. Doing in-home consultations allows me to meet the cats, learn about their personalities, and see their dynamics with the other cats in the home. This is important, as it helps me formulate a logical and effective behavior plan. I was able to see what made each cat tick and what set them off. I noted their favorite play methods and how we could use distraction when incidents arose. Their hands on parents were so dedicated to forming a peaceful household that it helped things go smoothly. We implemented more formal play routines, which worked as a bridge to strengthen the relationship between the cats. The humans understood what to watch for and were taught how to diffuse negative interactions before they happened. If/when incidents occurred, they quickly intervened and got the cats focused on appropriate activity. All of these behaviors were continuously reinforced using positive interactions and treats. One final part of the plan, and perhaps the missing piece to the puzzle, was the catio you built for them! 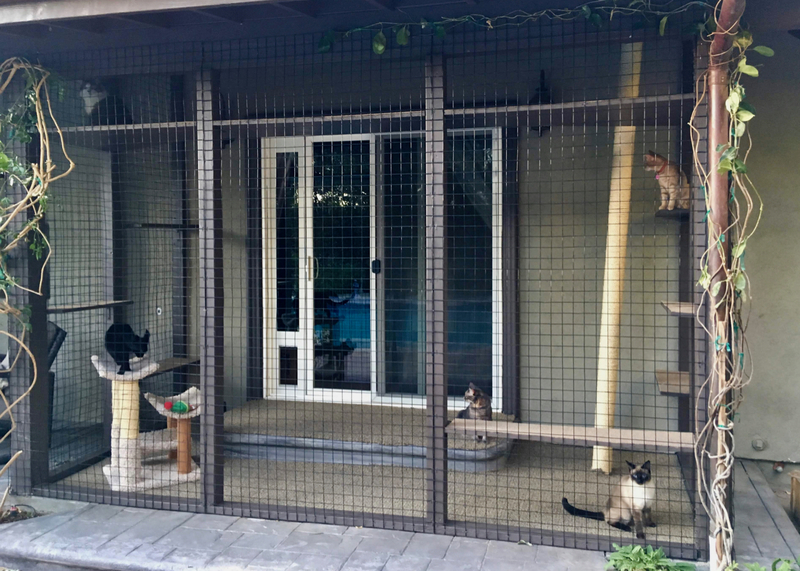 This was an extra special catio, as you took precautions to protect their special needs cat, Shiloh. The cats and humans absolutely LOVE it! Seeing pictures of the cats inside climbing brought an instant smile to my face. I’m a firm believer that having access to safe secure outdoor time can truly change a cat’s life. Catio Guy: Since we are a catio website, what is your professional opinion on outdoor cat enclosures? Cristin: EVERYONE with a cat should have a catio. My DIY catio is hands down the favorite part of my apartment. I’m a huge proponent of outdoor time for cats, but only if it is safe, secure, and easily supervised. Cats love spending time basking in the sun, getting fresh air, and watching all the things nature has to offer. Catios provide all that and more. There are too many bad things that can happen to cats that have free rein outdoors. Catio Guy: Finally, working with Jackson Galaxy, meeting top notch feline professionals like you, and watching educational cat shows on Animal Planet make me very optimistic about the future of cats in the home. What is your overall impression of the state of cat – human relations and what, if anything, would you like to see happen in the future? Cristin: I am SO happy that the overall status of cats is finally changing. I love being a tiny part of that change and I’m so glad there are people like you doing things like Custom Catios! It’s been rewarding to see people gain a better understanding of cats and realizing that we CAN fix many behavior problems. To be honest, most behavior “problems” are completely normal cat behaviors that we deem inappropriate because cats live inside with us. They just need a means to fulfill those innate, wild cat needs and compromise goes a long way in life – whether dealing with people or animals!